Serendipity Reviews: Even More Challenges!!! I know, I know, I moaned at the end of last year how I wasn't going to finish any of my outstanding challenges, yet this year I am joining them quicker than I can type about them. I just couldn't resist the following three challenges. I wasn't going to join this one and I can't for the life of me think why, especially as I loved it last year and it really opened my eyes to YA books, which I now own loads of. So I am going to go for the Just My Size Reading Challenge, which means I have to read 25 YA novels, something I know will be really easy for me. If you want to join JKaye's challenge, you can sign up here. I own so many books that either won or were nominated for the Booker Prize that it seemed silly not to join this one. If you want to join in too, the details are here. As I already own two of last year's nominees, I thought I would go for the following level. Booker Devotee: choose a year, and read all 6 shortlisted works from that year. My aim is to read all the shortlisted books and the winner from 2009, as I have heard such good things about all of these books. This challenges runs from January through to December 31. I am determined to read more international books this year, so I was pleased to come across this challenge to read Australian authors. I own some books by Trudi Canavan and K.E.Mills, but I would love some suggestions for other brilliant Australian authors. I am going for the first level which is TOURIST - Read and review 3 books by 3 different Australian authors. This runs from January 1st through to December 31st 2010. If you are interested in joining this one, you will find details of it here. This last challenge seems to be a real fun one as you can decide each month which way you want to take it. I think this one has been running since 2007 and each month you need to choose a book that deals with a celebration for that month, be it a birthday or an event. I have chosen to read 'Catcher in the Rye' by J.D. Salinger for January as he was born on January 1st. Though you don't have to choose birthdays, you can choose any significant event that happened in the month. Click here to find out more about this challenge. I can't guarantee that I have finished here, as I am interested in reading more international books, so anyone know of any good international challenges, please let me know. Enjoy, Viv! And good luck! Yes I signed up for a few challenges as well LOL. I can highly recommend Juliet Marillier (fantasy). I forgot about Trudi Canavan, I have one of her books sitting on my shelf, I must read it for the challenge. If you like Urban Fantasy there is also Keri Arthur and for historical romance I love Anna Campbell. Such a brave soul, good luck with all those challenges. 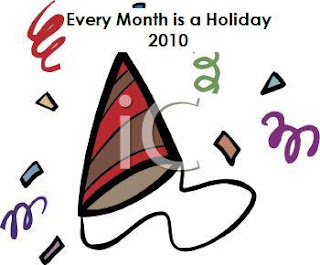 The Every Month is a Holiday Challenge does sound like a good one. Good luck with all of your challenges. Good luck with your challenges. I plan on signing up for the YA one bit have not done it yet. Vivienne, I may need to crown you the Queen of Challenges before too long! It is hard to resist such tempting challenges. Alaine - thanks for the author names. I just realised I had a Keri Arthur book. I have ordered Nim's Island from the library as the author now lives in Australia. Petty Witter - brave or stupid! Bermudaonion - The holiday one seemed a bit different and it meant I could read at least one book a month for it. Nicole - I can't wait to get into all these challenges now. Suko - I think Eva beats me as the Queen of Challenges. I live humbly in her shadow. Eva - the Aussie one does look good. I aim to rise to your level in challenges.LOL. i'll live vicariously through you and your challenges! i can barely get through my work day, find time to read, review, blog, and breathe! have no idea how people with kids manage. hope you had a great new year. What great Booker picks -- i want to read everyone on your list!!!! What fun challenges! Enjoy them. Good luck with the challenges! Fiona - thank you for those, I shall check them out. What would I do without you. Booklineandsinker - I am more than happy to add that, if I can work out how to do it. I am the most computer literate blogger around! Diane - I know,aren't they all fabulous. I have wanted to read all six since last year. Illiana, Kim and Alyce - thank you ladies for your support. You're becoming quite the little challenge addict, aren't you, my dear? :D Have fun, Vivienne! Thanks for joining The Complete Booker! I agree, the 2009 short list is very strong. Enjoy your reading! Welcome to the Young Adult Reading Challenge. This is going to be a fun reading year. I am like you. I keep on joining challenges! There are so many good ones this year. 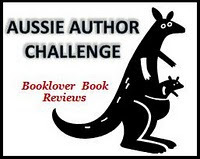 Thanks for joining me in the Aussie Author Challenge! If you're on the lookout for titles keep an eye on my Aussie Author In Focus series of posts over the next few months. And we have such a great range of reading tastes across those who've signed up to this challenge - we should end up with an excellent list of books as we all contribute our reviews. Look forward to sharing reviews with you! good luck with your challenges viv! you can do it!